Here’s another update to the scatter graphics, which compare the attacking and defensive performances of every team in a division. Each of the four graphics is explained briefly below and at length here. Coventry are the most dominant side overall – and by quite a distance – taking just under 14 shots per match and allowing fewer than half as many in return. 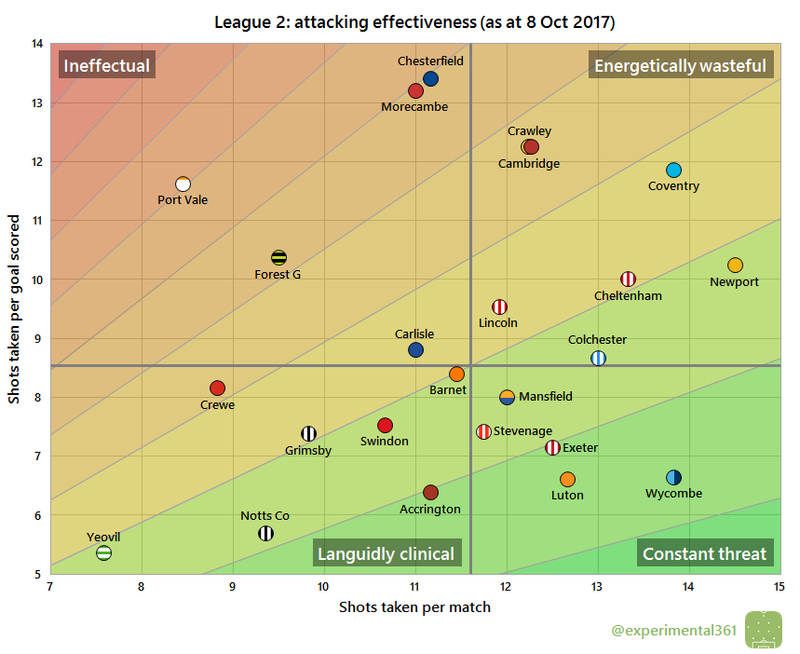 There’s no one team that stands out as the least dominant, although Yeovil are creating worryingly few chances and Morecambe are once again allowing plenty, with Crewe also giving their fans plenty to be concerned about. Newport continue to create the most chances in the division, although their defence has looked far more average. At the other end of that spectrum we have Port Vale, who allow relatively few chances but don’t create much themselves. I was wondering how Notts County were sustaining a promotion challenge off the back of such a modest number of chances and here’s at least part of the answer: only Yeovil have converted shots into goals more efficiently so far. Kevin Nolan’s side are outscoring Coventry and Newport despite taking around five fewer shots per match due to the wasteful finishing exhibited by the Sky Blues in particular. 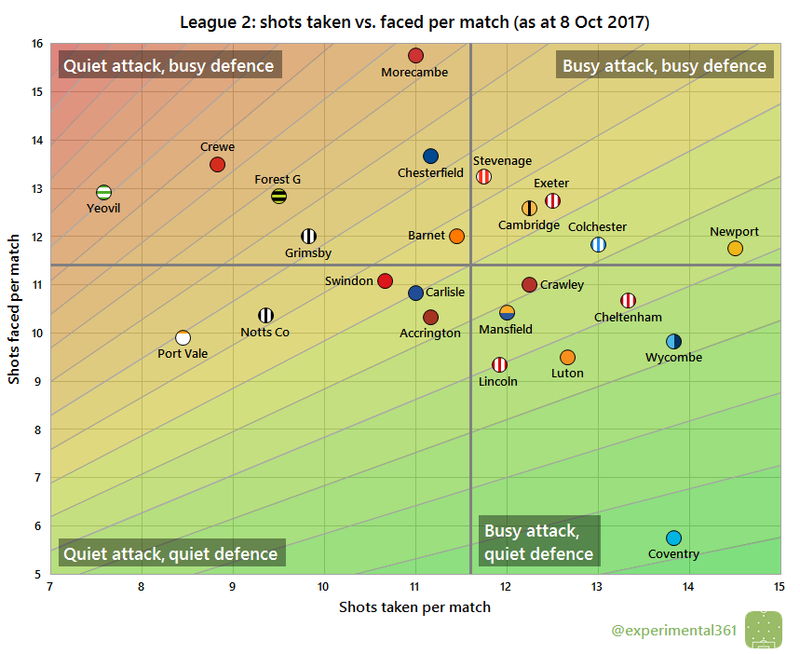 However there are bigger problems at both Chesterfield and Morecambe, who create a respectable number of chances but have needed around five more attempts than the average League 2 side – and over twice as many as a similarly productive Accrington – to find the net. Coventry‘s defence has looked impressive from the beginning – they’ve allowed far fewer shots than anyone else and are also one of the division’s most resilient at soaking up their opponents’ efforts. 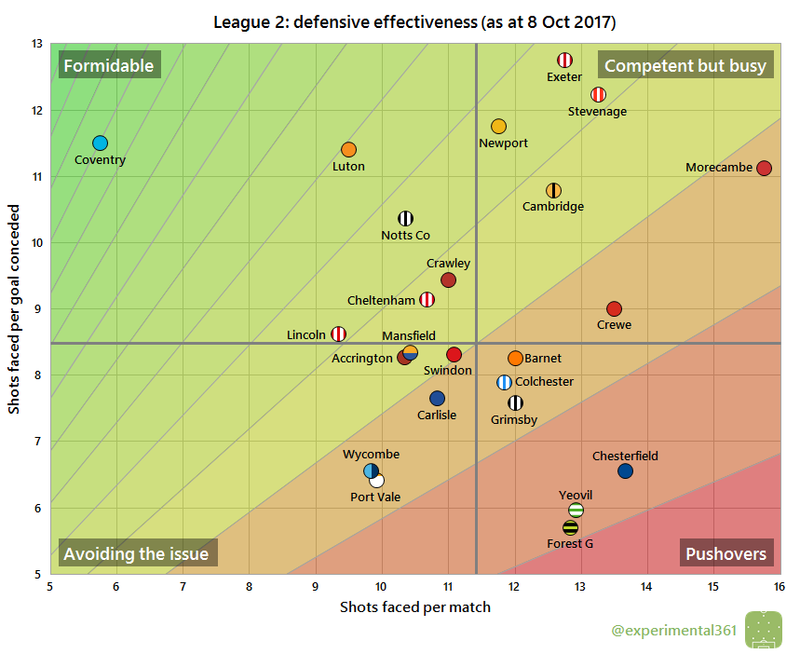 While Wycombe have looked impressive up front (see last chart) and are the division’s top scorers, a defence as leaky as struggling Port Vale‘s has kept their goal difference relatively modest. Exeter‘s stubborn defence has sustained their promotion charge so far and they’ve absorbed more shots per goal conceded than anyone else, although fellow challengers Stevenage and Newport aren’t far behind. While Coventry have looked the most impressive overall, their attack has looked pretty average compared to that incredible defence, so it remains to be seen whether they can score enough goals to see their dominance pay off. While few will be surprised to see pre-season favourites Mansfield and Luton looking healthy, they have plenty of company in Cheltenham, Wycombe and Lincoln in the desirable bottom right quadrant. All three look capable of at least a play-off finish as it stands. 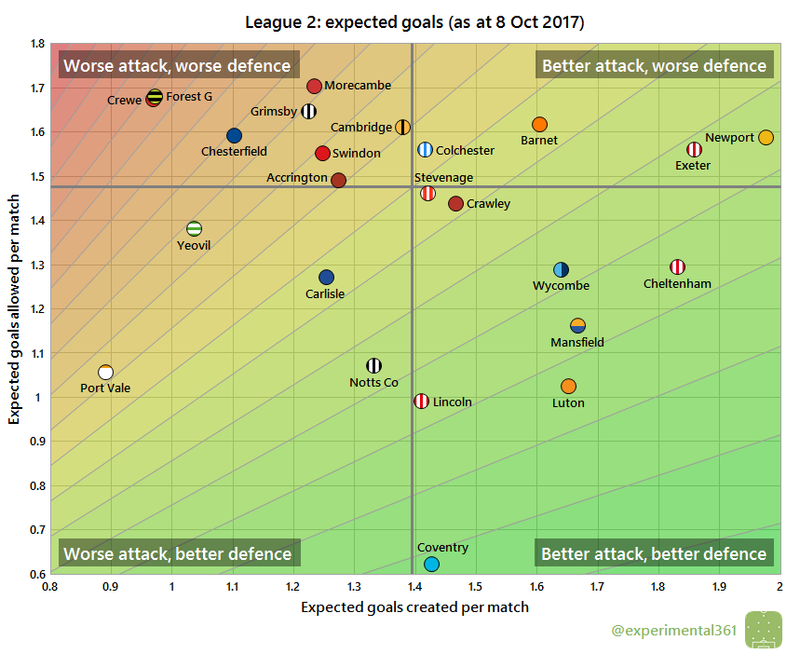 Crewe and Forest Green look to be in the most trouble overall, so while the former’s league position looks relatively healthy there’s a chance that they’ll stall if performances don’t improve. An honourable mention should go to Harry Kewell at Crawley, who has defied pre-season expectations of a relegation battle with some solid overall performances (cue collapse in form and him being sacked before Christmas).